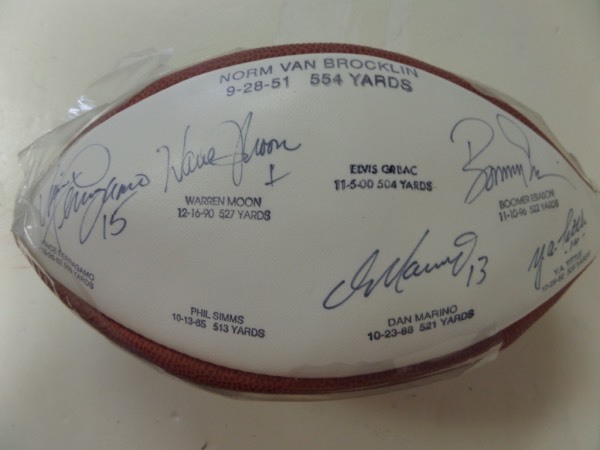 Coach's Corner - 500 Yard QB's multi signed/full size football, by 5!!! Go Back to Lot List 500 Yard QB's multi signed/full size football, by 5!!! This custom Wilson NFL leather football has one white panel, which lists the 8 quarterbacks who, at the time, were the only to throw for 500 yards in a single game. It is hand-signed by 5 of the 8, including Dan Marino, Y.A. Tittle, Warren Moon, Boomer Esiason and Vince Ferragamo. A fantastic collector's and display item, 100% guaranteed authentic, and retail is well into the hundreds!